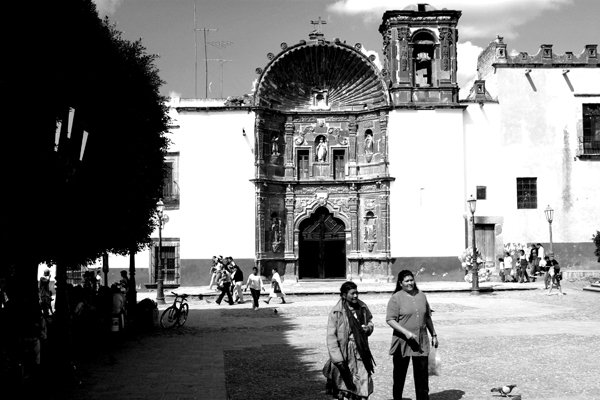 Most mornings I walk up the cobblestones of Aldama, past the magnificent pink lady, La Parroquia, and through the Jardín to San Miguel’s covered market, Ignacio Ramírez. It is a very pleasant walk and there is always something interesting to see. For instance, in the cool shade of the lower portales are the old women selling flowers. They have buckets of fragrant tuberose and carnations, tall lilies and vivid roses, but, with dia de los muertos just a few days away, mostly what they sell today are the bright orange marigolds whose scent is said to lead the spirits home. 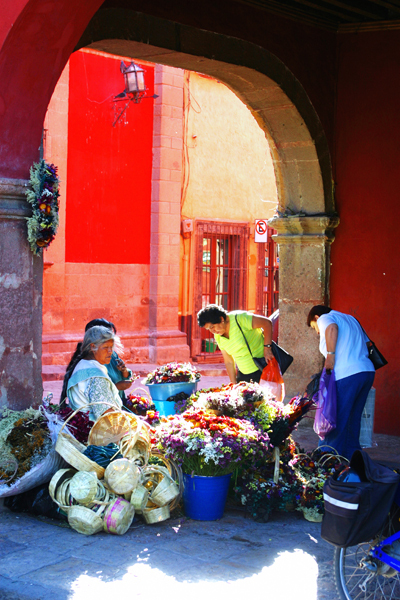 Flower sellers of San Miguel. Photos by David Lansing. Perhaps it was the thought of the marigolds and the upcoming celebration of the Day of the Dead, but for some reason, instead of continuing on straight to the mercado this morning, I stopped in at the church next door, Templo de Nuestra Señora de la Salud. The church of Nuestra Senora de la Salud in San Miguel de Allende. There was a small group of peasant women sitting in front of a radiant ivory statue of the Virgin, framed by a pale blue background. They were praying the rosary out loud, holding their leathery hands over their eyes and exhaling each Santa Maria while rocking gently back and forth as they ran out of breath at the end of each prayer. They wore dark rebozos and checkered aprons. While they prayed, several younger women brought their blanket-covered babies up to the Virgin, holding them out to her as if in offering. Many other women with their babies stood respectfully in line. When one woman finished offering up her child, another came up and did the same. Mother after mother offering up her child. Some touched the Virgin’s arm—lightly, gingerly, in supplication. Some placed a pink carnation or a red gerbera in her open palm. I sat there in the back of the church, watching these women, young and old, who prayed with such fervor to this smooth, cold statue. A long, long time ago, I believed the way they believe. And I wish that I still had that faith. But I do not. And I am sure it is my loss. Wow…your having some real moments there….Your description of your emotion and theirs is breathe taking at the least. Ive never had that much faith….more like fear. Growing up seemed as everyone used it as a tool of fear and discipline. My faith is in myself to always be able to move through life and try to have no regrets, and bad ills towards others decisions. I am moved by this post….Incredible writer…Novel? Hemingway would be taken with your writing. very sure. Gee, Sonia. I may have to hire you to be my agent. Seriously, thanks so much for your continued lovely comments. Geez David i know what you mean! Been disappointed myself& lost faith. But your writing is so good& descripive i ordered some Mexican tuberose and put more marigolds out. Maybe get visitors. Please keep up good work.